Last month, I made a big push with my November to Remember, No Excuses November, 30-day challenge 2014 to do a modified version of the Parkinson’s Recipe for Recovery® for 30 days. The 30 days ended yesterday, November 30, 2014. So, what’s next? Where do you go from here? Yesterday was November 30, 2014 and today is December 1, 2014. We have a way of putting labels and limits on our lives based upon what somebody at some previous time decided was correct. Theoretically, if somebody’s decision had been different, today would be November 31, 2014. What I am trying to point out to you is that much of what we think is real is a script written by somebody else, and we have been following the script and its rules without question. Faith says “I know I am going to be cured of Parkinson’s, and I will do the Parkinson’s Recipe for Recovery® every day until I am cured!” That’s it! So, what are you doing now? Part of why I am saying to be and live your cure is because life continues well beyond the Parkinson’s. It is learning to balance life that brings about the recovery and assists us in continuing our recovery for the rest of our lives. 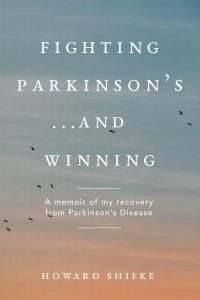 Another part of why I am saying to be and live your cure is because I have received some email inquiries asking if my Parkinson’s came back as a result of the car accident Sally and I were in a couple of weeks ago. Let’s be really clear about this: I am cured from Parkinson’s, and it never will come back. I am not afraid, and you should not be afraid either…please do not be afraid for me, and please do not be afraid for yourself. Our car accident was serious, and we were quite blessed with our injuries being what they were. Our car has been declared “totaled,” or “”a total loss.” So, in light of the extreme damages to our car, we give gratitude every day for the outcome in our lives. I have continued to have my coaching, and many people have seen me on FaceTime and Skype over the last two weeks. Some have seen pictures of our car and understand the blessings Sally and I received that day in our physical beings. Also, I am going to be Seattle doing an all-day workshop on December 6th, in 5 days. I bring my medical records to all of my workshops. They show me getting diagnosed, and follow up visits show progression of Parkinson’s, and then twice in a row (16 months apart) no signs or symptoms of Parkinson’s…NO PARKINSON’S! That is never going to change…NO PARKINSON’S! I am on FaceTime and Skype, and I am doing an all-day workshop in Seattle in 5 days…people have seen me and will continue to see me. I am not hiding. I have nothing to hide in my physical being. I have NO PARKINSON’S. This should clarify for any of you with doubt about my physical being since the car accident that Parkinson’s has not returned to me. I guess you will just have to take my word for it that Parkinson’s NEVER will return to me. However, why take my words for it when you can do it yourself. Make the commitment to yourself to faithfully, fearlessly cure yourself from Parkinson’s. Today is December 1, 2014. How about that. What are you doing right now? How about making the commitment to yourself to cure yourself from Parkinson’s, and then living your cure in all you do, physically, mentally, and spiritually. wow, Howard, I didn’t know how serious your accident was. What a miracle that you and Sally only sustained minor injuries. “Thank-you, God, for not taking Howard and Sally. We need them!” Love you, and so blessed to have you…..Parkinson’s free! Hi Howard, of course you are done with Parkinson’s, you have healed Spiritually, Emotionally and Physically so why would it return? Madness! Anyway hi to you and all the gang on here. I did great in November, did full protocol nearly every day( 3 days missed over the month) My kidneys and bladder are going from strength to strength. I have also noticed as a bonus, my waist has got smaller with all the bending to the sides lol. My greatest achievement was today. I arranged to go to grocery shop with a friend. This is Massive for me as I have not been shopping in 3 months as my mobility is so bad and so I am self conscious. Time to kick down fear fences and live my life to the full. Had an amazing chat with a beautiful soul who guided me to childhood hurts that I needed to make peace with, so been having big chats with little Karen, lots of tears and letting go, she is helping me heal and together we are stepping into authentic Karen, very powerful. Hope everyone else is doing well. With you all in spirit. Big love and appreciation to Howard. That is so lovely Karen, well done, it warms my heart to hear your words. Blessings and thanks to Howard and Sally. Now back in the UK and more settled in, please count me in if you can ever manage a UK conference. In all my “soul journeying” over the years, one saying stood out for me – “The physical universe rewards action, not just thoughts and words”. For me, it’s been the one thing that’s constantly reminded me to DO, and not just think about doing. When I let my Parkinsons brain get to me, in moments of weakness (we all have them), I do one of the parts of the Recipe for Recovery – usually Jumper Cabling – and I settle down again, feeling stronger, and get back to being my recovery again. I also find that a walk outside in the fresh air (especially now when it’s a little brisk!) clears my head beautifully, pumps oxygen into my body, helps my balance, and improves my attitude 100%!! I sincerely hope this resonates with some of my fellow travelers! Thank you for your uplifting contributions, they encourage me to do daily as much from the recepiy as I can. Awwww thanks Mayarita, listen my friend, I was so Inspired when I read about you in yesterday’s comments. You have a 6 year old, how brave and courageous you are and strong in dealing with this condition and rearing a beautiful child. I’m a mom, I know how precious that is. You ROCK my friend. You are Inspirational. Mayarita, as a fellow single mum, I want to echo what Karen said – how great you are to be doing the recipe, and to be doing it for your child. What a legacy! I find it helps timewise if I double up: do affirmations while standing and balance, doing jumper cabling while eating muesli (one mouthful per finger!). Never give up! Thank you Helen C . That is so encouraging to hear your words on days when i feel like my head is only just above water. We can and must do it! These posts are so very uplifting, encouraging to me. I see myself in others’ comments about their struggles, disappointments, shortcomings, and I don’t feel so alone! Thanx all for your transparency. I just wanted to share about my yearly check up with my neurologist that I had yesterday. I have been his patient for over 3 years now and he hasn’t witnessed any significant deterioration in my symptoms. I am not on any medication. He was obviously surprised but, unfortunately, not interested in considering why that might be. My parkinsons nurses, who I see every three months, are also pleasantly surprised by my lack of deterioration! I just wanted to let everyone know that I’m convinced that doing the recipe is making a difference to me, even though I struggle with doing all of it every day. Reading about everyone’s progress and commitment has been inspiring and keeps me motivated when I struggle. So thank you everyone for sharing. I feel as I’m part of a wonderful family and I’m truly grateful for everyone, but in particular to Howard who very generously created this space for us all. I am so excited. Tomorrow I will be doing my exercises with Howard. I am going to the Workshop in Seattle ! I feel full of gratitude and love to Howard and also to my wonderful Husband for making this possible for me. I wish that each of you could be there also. It would be so fun to meet all of you. Know that I will be carrying all of you around in my heart as I go through the day, and as we do the exercises. Hope you all have the best of weekends.. Thanks for sharing this journey with me. Mayarita, I’m doing great in some respects, but equally I’m still bouncing of the walls as my mobility is so bad, my feet freeze so much. Had my first fall yesterday, but I still have my sense of humour and know I am healing from the inside out. So, hang in there girl, you are in good company. Wow Debbie, so excited for you going to the Seattle worshop and meeting our awesome coach. Please give him and Sally a big hug from me. I am looking forward to you sharing your day with the rest of us. We might get to see you if Howard posts a photo. Enjoy, enjoy, enjoy.